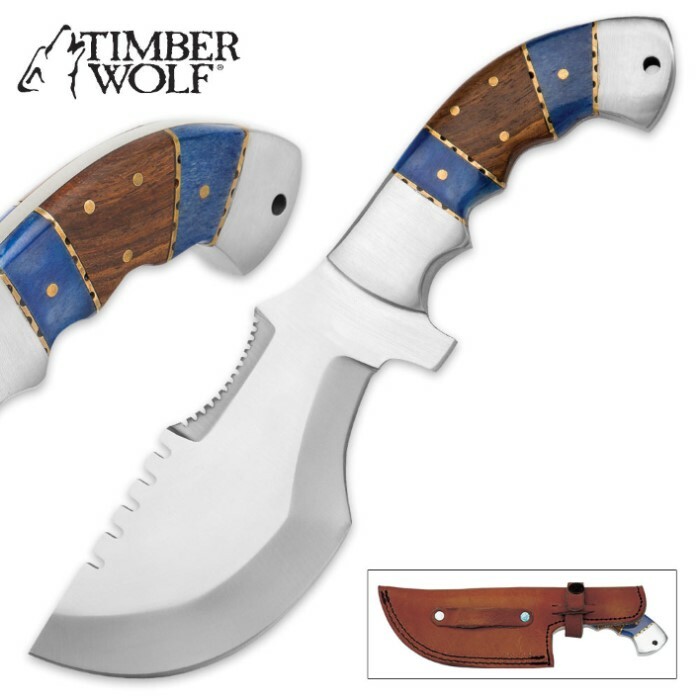 Timber Wolf Washakie Tracker / Fixed Blade Knife with Leather Sheath | BUDK.com - Knives & Swords At The Lowest Prices! If you can only take a single knife with you into the wilderness, Timber Wolf's Washakie Tracker is undeniably the knife to choose. 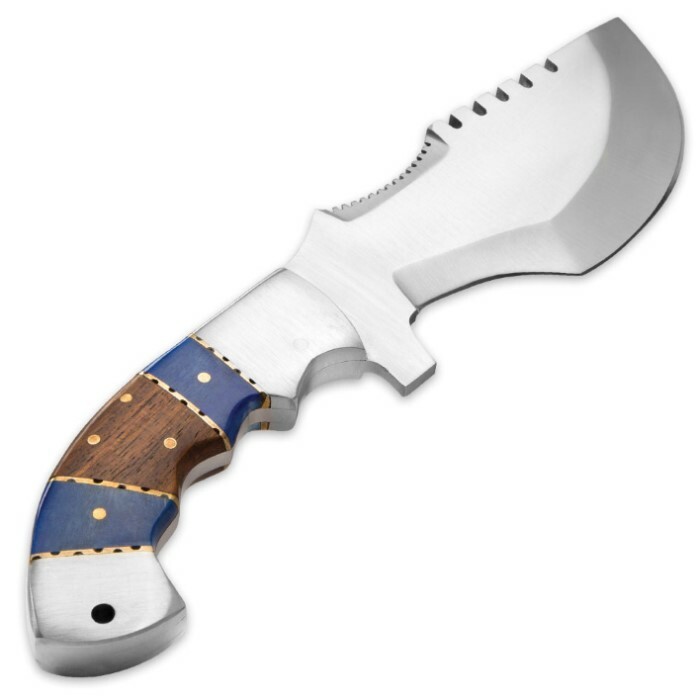 It features a robust 5 3/4" stainless steel blade and a handsome camel bone and hardwood handle, but the Washakie is so much more than just a stout, attractive fixed blade. Remarkably versatile, each area of the distinct blade is engineered to execute specific functions - sawing, chopping, carving and more. Use the Washakie to gut and skin an animal, then scrape the hide with it. Lash it to a pole and use as a spear, or throw it like a tomahawk. Saw away branches with the saw blade, then flip the Washakie over and split them with the chopping blade. The list of potential uses goes on and on! Tough and reliable, though it is, the Washakie is more than just a workhorse, as well. The skillfully designed fixed blade knife is also a visual stunner, boasting elegant handle scales carved from cobalt- and azure blue-tinted camel bone and fine hardwood with natural shades of tawny, mocha and burnt umber. Each carefully fitted handle scale beautifully showcases its own natural grain and is offset by scalloped brass spacers and stainless steel bolsters. With its arched handle and ergonomic finger grip, the Waskakie is also a pleasure to wield. Impeccable balance and weight distribution improves cutting response and reduces user fatigue - vital for demanding field tasks like building shelter or chopping firewood. The handy lanyard hole lets you secure the Washakie to your wrist while working or to a backpack during transport. 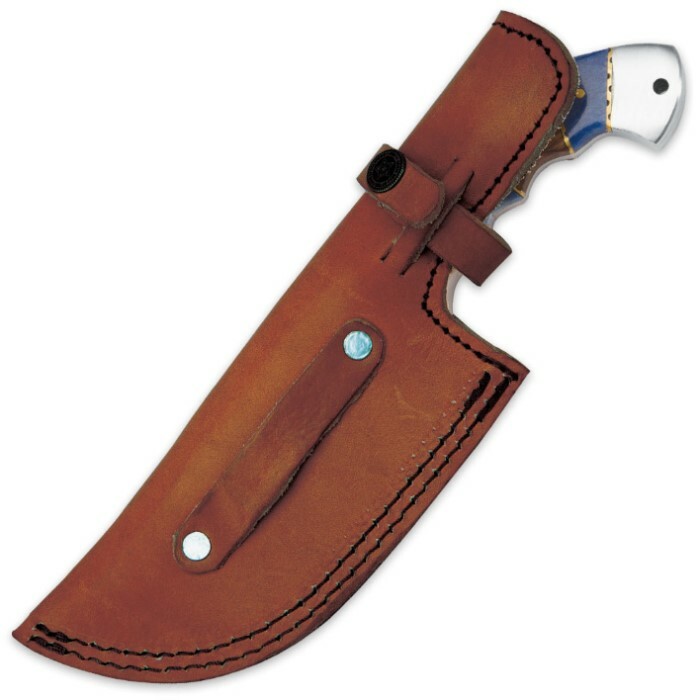 Speaking of transport, carrying the Washakie in the field is a breeze, thanks to the convenient belt sheath. Crafted from rugged genuine leather, the sheath also prevents corrosion and other damage, and helps protect the Washakie's finely honed edge. Truly a multitalented wunderkind of a knife, the Washakie Tracker is more than just a jack-of-all-trades - it's a multifunctional master of them all! And since it's from Timber Wolf, rest assured that despite its incredibly affordable price, the Washakie's quality is top notch - built to last a lifetime and beyond!